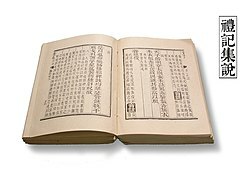 This category lists works related to Confucianism hosted on Wikisource. Note: Works listed here may contain Chinese text. Without proper rendering support, you may see question marks, boxes, or other symbols instead of Chinese characters. The Classic of Rites, one of the Five Classics of Confucianism. Confucius from the 1911 Encyclopædia Britannica. This page was last edited on 4 October 2017, at 15:46.